Cover and link to my Prayer Book! Please link and spread the good news! The Vatican fights back. . .calls Belgian parliamentary condemnation of the Holy Father's statement on condom use "an attempt at intimidation." Virgin Mary, Ark of the Covenant? Fr. Nicanor Austriaco, OP on "Reading Genesis with Cardinal Ratzinger"
The 1962 Sancta Missa with text and audio! 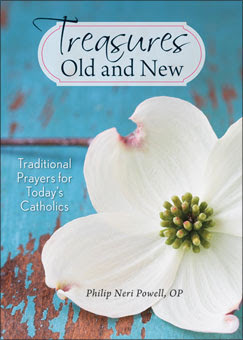 Traditional Catholic books from Sophia Institute Press: $2.00! 1. "Mission": all of the addresses I read (four of them) exhort the sisters to mission. But never the mission of the Church that we would recognize as evangelization, that is, the preaching and teaching of the gospel that Christ gave to the apostles. The mission the sisters are exhorted to take up is always, always some form of left-liberal social engineering disguised as caring for Earth or insuring access to adequate health for women. 2). Insularity: despite the exhortations to "mission," all of the addresses I read include broad descriptions of the history of women religious as a way of "situating" the experience of these women within their own "mission," in other words, they spend a lot of page space on talking to one another about one another's grand innovations after the VC2 and how these innovations are radically different from anything that's come before. There's quite a bit of self-congratulation here, along with laundry lists of excuses why their missions have failed to produce global results. The villian in their failures, by the way, is always the hierarchy. Big surprise. 3). "Prophetic": as a corollary to their mission and insularity, the addresses harp on how "prophetic" women religious are in these innovations. As far as I can tell, "prophetic" means whatever they want it to mean. It clearly does not mean what the Church means by the term. If the examples used are typical, "prophetic" means something like "doing what we please and then accusing the Church of being too traditional, oppressive, and isolated from the world for not following our lead." Beware self-anointed prophets! 5). Futility: without exception the addresses I read painted depressing portraits of women religious as a tiny rebel band fighting the Sheriff of Rome. As part of the insularity painted by these addresses is a tragic sense of loss and the futility of their "mission" in the face of overwhelming authoritarian oppression by men. Apparently, we are to believe that women religious in the U.S. are guerrilla-fighters engaged in a war of attrition against the Church. Unfortunately for them, the attrition is all on their side. Rhetorically, these portraits serve an important purpose: by painting themselves as righteous rebels fighting a losing battle agaist the Man, the sisters are able to both continue their rebellion and justify their material failures all the while claiming moral victory. Neat, uh? 6). Jesus ain't the Way: also without exception the addresses forthrightly deny Jesus' own claim that he is the Way, the Truth, and the Life. As a way of undermining the Church's legitimate mission of evangelization, Jesus becomes just another good guy with a really cool message of pacificism, egalitarian communal life, and a feminist concern for eco-politics. In one address, delivered by Joan Chittister, the arrival of mosques in historically Christian lands is celebrated as a great advance for liberty and the pursuit of religious diversity. She argues that worrying about the decline in numbers of women religious is a "capitalist question" and holds that the the decimation of covents and monasteries after VC2 is a good sign for the Church! Apparently, the complete loss of a discernible Christian identity among some women religious is to be celebrated as a movement of the Holy Spirit and a great advance in human-spiritual evolution. 7). Monotonality: the addresses are uniformly written and delivered by women religious who tell the gathered sisters only what they wanted to hear. There were no addresses that seriously challenged any of the preconceived notions held dear by these women. Without exception. the meme's of "We Are the Future and Our Agenda is of God" is heard in terms of ecclesial revolution and theological dissent. Not one address challenged the sisters to rethink their assumptions along orthodox lines. Not one address asserted a theme, idea, theology, or political notion that would upset or stir the secular feminist pot these women are stewing in. Despite the constant harping on the need for a variety of voices to be heard in the Church and the desperate need for new ideas among God's people, these addresses repeated in predictable loops one stale feminist cliche after another. Ironically, the obstinate refusal to listen to different voices is routinely described as a failing characteristic of the male-dominated Church hierarchy! 8). New Stories: as a result of the We Missed Out theme, the addresses pull on recent developments in cosmology to construct "new stories" about creation, space-time, human evolution, and the role of consciousness in our pursuit of holiness. Of course, none of these new stories read like anything found in scripture, tradition, science, or Church teaching. In fact, the purpose of the new stories is to lay a narrative foundation for a particularly gnostic-feminist view of the human person that "frees" us from the confines of patriarchal thinking by re-situating the human race as just another evolved species living and dying in a vast cosmos. Routinely, the addresses privilege "new cosmologies" over and against our biblical narratives of creation and the end of space-time, and undermine God's Self-revelation in scripture. Rhetorically, the new cosmologies give the sisters a means of defying our Judeo-Christian tradition with the authority of modernist science. Unfortunately, their grasp of the scientific details of cosmology is woefully inadequate, leaving them to play with a pathetic parody of actual cosmological theories. Let me point out here that the LCWR is a leadership conference. By no means am I attributing these themes or attitudes to all women religious in the congregations that participate in the LCWR. I know sisters in LCWR congregations who fret about the feminist turn of their communities and lament the loss of their Christian identity to trendy New Age gnosticism. Younger women religious aren't buy this anti-Church junk food, choosing instead to nourish themselves on the vast variety of legit Catholic traditions well within the generous range of orthodoxy. My fisking here is directed at the addresses themselves and what they tell us about what the LCWR is hearing and/or wants to hear. As anyone who's a member of a large organization knows: leadership is often way, way out in front of those they lead. . .sometimes too far out. I think this is certainly the case with the LCWR. I could go on. . .but it's time for another bowl of coffee! Apparently, Fr. Jenkins, president of Notre Dame, is prepared to "dialogue" with our Abortionist-in-Chief but not with his own students. Fr. Jenkins is prepared to subject this year's graduating class to a monologue from The One and call it dialogue, but he is not prepared to sit down with those he is charged with educating and assure them that N.D. is essentially Catholic. . . .thus putting to death the excuse that The One's invitation to Notre Dame is all about "dialogue." This is why the Vatican is performing a "theological assessment" of women's religious congregations in the U.S. . . The dynamic option for Religious Life, which I am calling, Sojourning, is much more difficult to discuss, since it involves moving beyond the Church, even beyond Jesus. A sojourning congregation is no longer ecclesiastical. It has grown beyond the bounds of institutional religion. Its search for the Holy may have begun rooted in Jesus as the Christ, but deep reflection, study and prayer have opened it up to the spirit of the Holy in all of creation. Religious titles, institutional limitations, ecclesiastical authorities no longer fit this congregation, which in most respects is Post-Christian. When religious communities embraced the spirit of renewal in the 1970s, they took seriously that the world was no longer the enemy, that a sense of ecumenism required encountering the holy “other,” and that the God of Jesus might well be the God of Moses and the God of Mohammed. The works of Thomas Merton encouraged an exploration of the nexus between Eastern and Western religious practices. The emergence of the women’s movement with is concomitant critique of religion invited women everywhere to use a hermeneutical lens of suspicion when reading the androcentric Scriptures and the texts of the Tradition. With a new lens, women also began to see the divine within nature, the value and importance of the cosmos, and that the emerging new cosmology encouraged their spirituality and fed their souls. As one sister described it, “I was rooted in the story of Jesus, and it remains at my core, but I’ve also moved beyond Jesus.” The Jesus narrative is not the only or the most important narrative for these women. They still hold up and reverence the values of the Gospel, but they also recognize that these same values are not solely the property of Christianity. Buddhism, Native American spirituality, Judaism, Islam and others hold similar tenets for right behavior within the community, right relationship with the earth and right relationship with the Divine. With these insights come a shattering or freeing realization—depending on where you stand. Jesus is not the only son of God. Salvation is not limited to Christians. Wisdom is found in the traditions of the Church as well as beyond it. There you have it, brothers and sisters, the rotted core of "Post-Christian" theology among the detritus of religious feminism in the U.S. It's not entirely clear from the address which of the four options Sr. Laurie prefers. The address is difficult to read b/c of its overall tone and protest-rally placard sloganeering. Sr. Laurie can't seem to decide if the Church spends most of its time and energy oppressing women or ignoring them. Or perhaps the Church is oppressing them by ignoring them? This indecision is revealed, for the most part, in the pervasive rhetoric of victimization and her choice to the repeat anti-Catholic stereotypes most often found on the pages of the NYT. UPDATE: For those wondering why the so-called "Sojourning Sisters" refuse to do the obvious and honest thing and just leave the Church that has allegedly made their spiritual lives so unbearable, here's my semi-professional diagnosis: "Rebels Without a Clue." However, Obama's changes [to the Bush policy] may not be absolute. His advisers are considering adding a classified loophole to the rules that could allow the CIA to use some interrogation methods not specifically authorized by the Pentagon, the officials said. They said the intent is not to use that as an opening for possible use of waterboarding, an interrogation technique that simulates drowning. For Obama, who repeatedly insisted during the 2008 presidential campaign and the transition period that "America doesn't torture," a classified loophole would allow him to follow through on his promise to end harsh interrogations while retaining a full range of presidential options in conducting the war against terrorism. The proposed loophole, which could come in the form of a classified annex to the manual, is designed to satisfy intelligence experts who fear that an outright ban of so-called enhanced interrogation techniques would limit the government in obtaining threat information that could save American lives. It would also preserve Obama's flexibility to authorize any interrogation tactics he might deem necessary for national security. However, such a move would frustrate Senate Democrats and human rights, retired military and religious groups that have pressed for a government-wide prohibition on methods they describe as torture. . .
Of course, The Loophole has to be classified. Probably the only good thing to come out of The One's election. . .
Update: Lord! Even the French think B.O. is a wimp. Next thing you know The One will be getting spanked by Luxembourg! The Devil is after my DELL! Another yellow line has appeared on my monitor. . . I think the Devil is trying to prevent me from finishing this manuscript! The novenas are more or less done. . .
Just seven more litanies, and I'll be finished with the first draft of the book! Keep those prayer coming, please! While waiting for my first bowl of coffee to kick in, I compiled these links to useful info for Catholics. Enjoy! Huge list of novenas. . .if you pray one of these, don't forget your fav Dominican! And let's not forget my favorite Dominican website. . . In the resurrection, we see the most sublime fulfilment of what this text describes as the beginning of all things. God says once again: “Let there be light!” The resurrection of Jesus is an eruption of light. Death is conquered, the tomb is thrown open. The Risen One himself is Light, the Light of the world. With the resurrection, the Lord’s day enters the nights of history. Beginning with the resurrection, God’s light spreads throughout the world and throughout history. Day dawns. This Light alone – Jesus Christ – is the true light, something more than the physical phenomenon of light. He is pure Light: God himself, who causes a new creation to be born in the midst of the old, transforming chaos into cosmos. And so, dearly-beloved, if we unhesitatingly believe with the heart what we profess with the mouth, in Christ we are crucified, we are dead, we are buried; on the very third day, too, we are raised. Hence the Apostle says, "If ye have risen with Christ, seek those things which are above, where Christ is, sitting on God's right hand: set your affections on things above, not on things on the earth For ye are dead, and your life is hid with Christ in God. For when Christ, your life, shall have appeared, then shall ye also appear with Him in glory." But that the hearts of the faithful may know that they have that whereby to spurn the lusts of the world and be lifted to the wisdom that is above, the Lord promises us His presence, saying, "Lo! I am with you all the days, even till the end of the age." For not in vain had the Holy Ghost said by Isaiah: "Behold! a virgin shall conceive and shall bear a Son, and they shall call His name Emmanuel, which is, being interpreted, God wire us." Jesus, therefore, fulfils the proper meaning of His name, and in ascending into the heavens does not forsake His adopted brethren, though "He sitteth at the right hand of the Father," yet dwells in the whole body, and Himself from above strengthens them for patient waiting while He summons them upwards to His glory. If [God] had no need of the flesh, why did He heal it? And what is most forcible of all, He raised the dead. Why? Was it not to show what the resurrection should be? How then did He raise the dead? Their souls or their bodies? Manifestly both. If the resurrection were only spiritual, it was requisite that He, in raising the dead, should show the body lying apart by itself, and the soul living apart by itself. But now He did not do so, but raised the body, confirming in it the promise of life. Why did He rise in the flesh in which He suffered, unless to show the resurrection of the flesh? And wishing to confirm this, when His disciples did not know whether to believe He had truly risen in the body, and were looking upon Him and doubting, He said to them, "Ye have not yet faith, see that it is I;" and He let them handle Him, and showed them the prints of the nails in His hands. And when they were by every kind of proof persuaded that it was Himself, and in the body, they asked Him to eat with them, that they might thus still more accurately ascertain that He had in verity risen bodily; and He did eat honey-comb and fish. And when He had thus shown them that there is truly a resurrection of the flesh, wishing to show them this also, that it is not impossible for flesh to ascend into heaven (as He had said that our dwelling-place is in heaven), "He was taken up into heaven while they beheld," as He was in the flesh. If, therefore, after all that has been said, any one demand demonstration of the resurrection, he is in no respect different from the Sadducees, since the resurrection of the flesh is the power of God, and, being above all reasoning, is established by faith, and seen in works.